Birds have to fly, fish have to swim, and batteries have to die. It’s just the science of automotive battery technology. Whether it’s a parasitic drain, normal self-discharge, or simply wearing out, the ways a battery can die are manifold. Luckily, the ways to keep a battery from dying are almost as numerous. The key is to identify the reason a battery died or the factor that could potentially cause it to die in the future, and address it head-on. There are a ton of different reasons a car battery can die, but extreme temperatures fall pretty high on the list. Cold weather can push a weak battery over the edge since very low temperatures result in less available amperage to crank over an engine, but hot weather is a literal battery killer. On the other hand, a parasitic drain will knock out even a brand new battery. Although the battery will almost certainly charge back up just fine, especially if you have a trickle charger on hand, the presence of a drain in the system will just cause the battery to go dead again. In order to prevent the chance of that kind of drain during storage, it might be tempting to simply disconnect the battery. But while it’s true that will prevent any errant drain in the vehicle’s electrical system from killing the battery, normal self-discharge will, eventually, drain even a brand new battery to a dangerously low level. There isn’t a lot you can do to protect your battery from the ravages of hot summer weather or the bitter cold of winter, aside from garaging. If that is an option, then the lack of extreme temperature swings may help your battery last longer than it otherwise would. However, the best way to help prevent hot or cold from killing a battery is to just make sure it’s always in the best shape possible. What that means is that a battery that is properly maintained is better equipped to handle the types of severe temperature swings that can cause problems. For instance, the electrolyte in a battery is more likely to evaporate away during the hot summer months, so it’s important to keep it topped off. Low electrolyte negatively affects battery performance, and you never want to drive around with the plates exposed. Filling the electrolyte when it gets low helps but it's also important to know how strong, or weak, the solution is. One of the biggest indicators that a battery is on the way out is if the electrolyte remains weak even after the battery no longer accepts further charge, or if one cell is weaker than the others. This can be checked with a simple hydrometer or with a refractometer. In the same vein, keeping the electrical connections clean, and the battery properly charged, will help during the cold winter months when less cranking amperage is available. The capacity of a lead acid battery can drop about 20 percent when the temperature hits freezing, so every amp counts the further the mercury drops. This is especially true of smaller batteries that don’t have a lot of cold cranking amps, to begin with, and in applications where the cranking amperage of the battery is relatively close to the amperage, the starter motor requires to crank over. Identifying a parasitic drain before it kills your battery can be tough since you typically won’t notice anything out of the ordinary. Although it’s easy to leave your headlights on accidentally without noticing, that type of situation actually has an outward indicator that something is wrong. In the case of many parasitic drains, the component that’s drawing amperage when your car is off does nothing to draw your attention until you go to start your car and hear the starter motor click fruitlessly. The good news is that, unless your battery is already old and worn out, going dead one time from a parasitic drain isn’t going to cause too much lasting damage. The key is to identify the source of the drain, and fix it, and prevent the battery from being drained down multiple times. Since permanent damage is done every time the voltage of a lead acid battery drops below a certain threshold, it is a good idea to deal with this type of problem sooner rather than later. Although there are a lot of ways to find and fix a parasitic draw, the easiest is to use a simple process of trial and error. With the ignition off, and the battery disconnected, you can use a test light to check for a drain. If a test light connected to the battery terminal and disconnected cable lights up, that means something in the system is drawing power, or that a relay is trying to energize. You can also use an ammeter for this type of diagnostic work, but it’s important to use the right scale so that you don’t blow a fuse in the meter. Either way, you can often track down the source of a parasitic drain by simply removing fuses, one after the other, until the light goes out, or the ammeter drops to zero. With an appropriate circuit diagram, you can then trace the drain to a specific component or components. One of the most common causes of this type of drain is a trunk or glove compartment light that illuminates due to a malfunctioning switch since there’s no way to see that these lights are on when the trunk and glove compartment are closed, but drains can be significantly harder to track down. 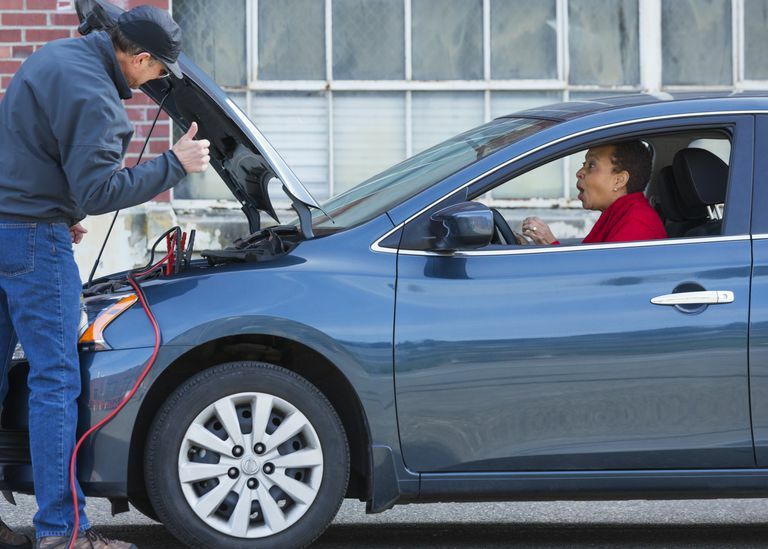 Depending on how long you plan on leaving a vehicle in storage, you may not need to do anything at all, or simply disconnecting the battery could do the trick. However, self-discharge will cause even a new battery to slowly lose charge. Although lead-acid batteries do have a relatively slow self-discharge rate, about 5 percent each month, long-term storage can allow normal self-discharge to drain a battery to a dangerous level. If you want to prevent your battery from dying during a long period of storage, there are two solutions. The first is to charge it up from time to time, and the other is to use a float charger that automatically charges when the battery drops below a certain voltage level. Although a battery tender, or float charger, will prevent the battery from dying while your vehicle is in storage, it’s still a good idea to monitor the situation from time to time. If something goes wrong, and the charger doesn’t switch off, that could also damage your battery.